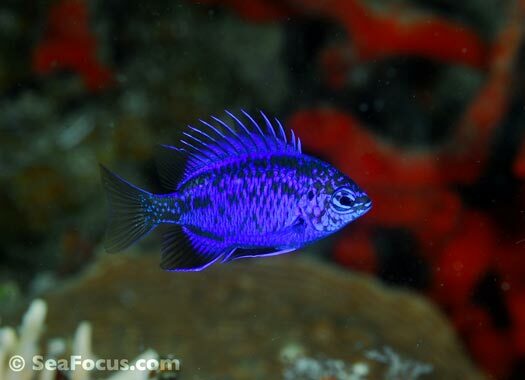 Damselfish belong to the Pomacentridae family, which consists of four subfamilies, 28 genera and about 315 species. 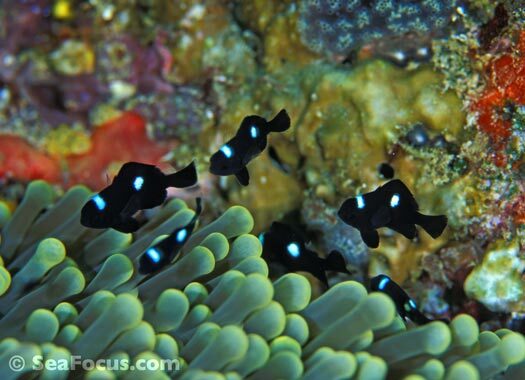 Best known relatives on the extended family line are the clown or anemone fishes, but chromis are also close family. 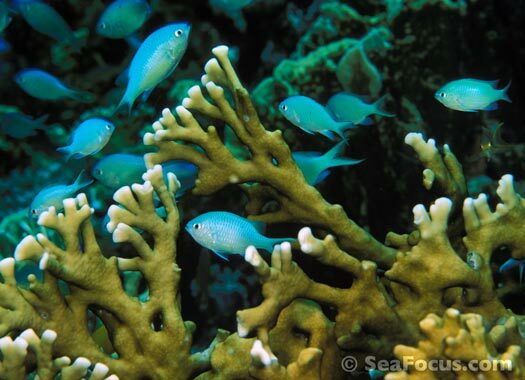 Spotting a damselfish isn’t difficult but it can be hard to tell which is which. 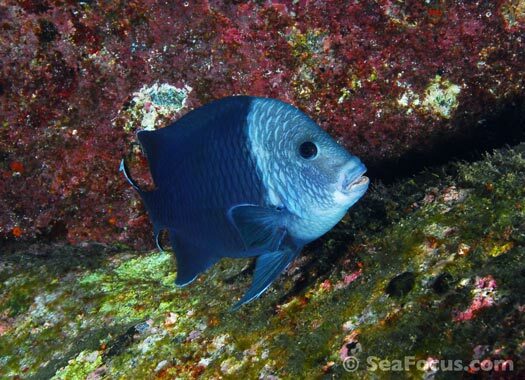 Their body colours and patterns vary, but all have a deep, compressed body plus a single continuous dorsal fin. 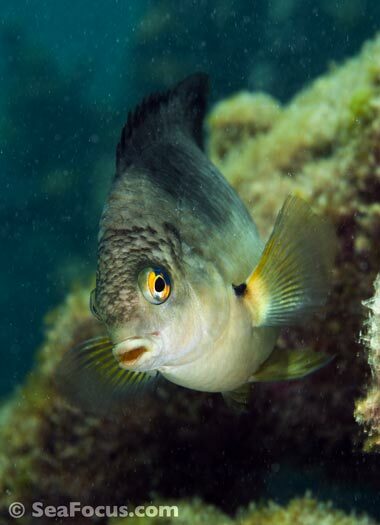 They have small mouths and a toothless palate and you can identify them by looking at their nostrils. 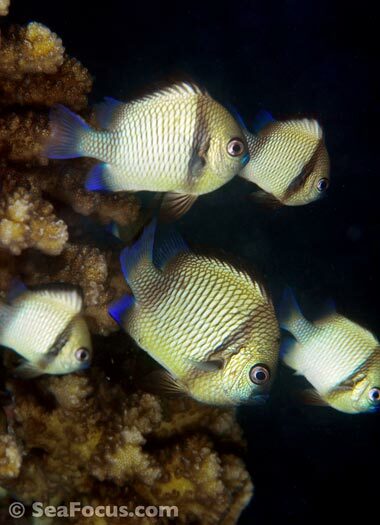 Damsels are one of only two families with just one pair! With such tiny mouths they have become quite specialised in their eating habits with tiny planktons and plants being the food of choice. 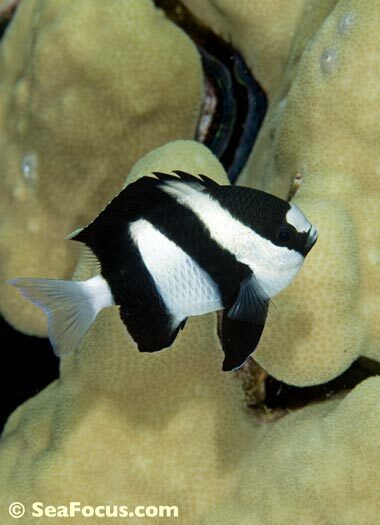 It’s common to see them pecking madly at an algae covered rock. 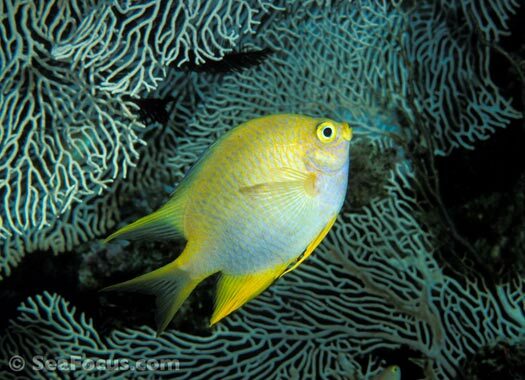 However, much of a damsels life is focussed on not being someone else’s dinner. Being small, they are preyed upon by anything with a mouth big enough to swallow them. 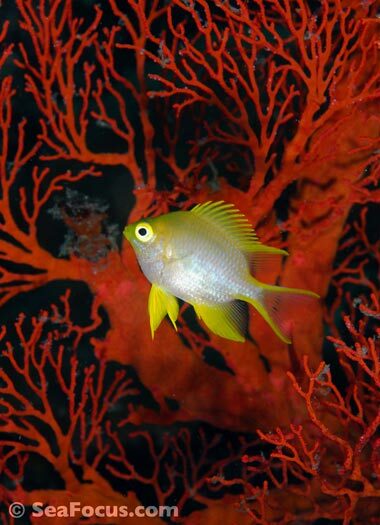 This makes them rather aggressive little fish – not only will they chase off any potential predator, they’ll chase off anyone that they don’t much like the look of. 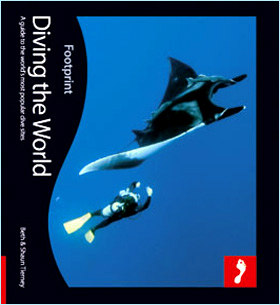 Including divers. 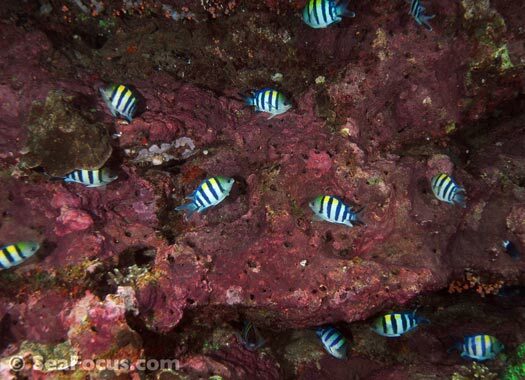 When it comes to continuing the family line, most damsels are substrate spawners, laying their eggs in a spot where they can attach to the surface. 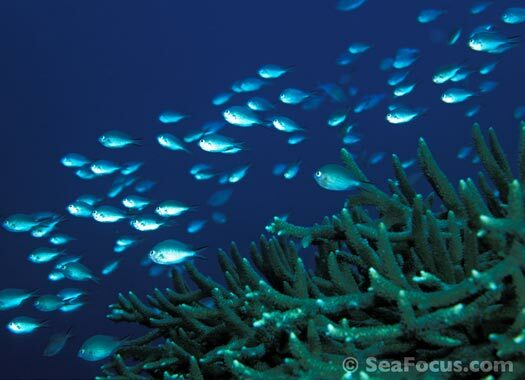 A shimmering purple rock on the reef displays the tell-tale signs of a spawning site. 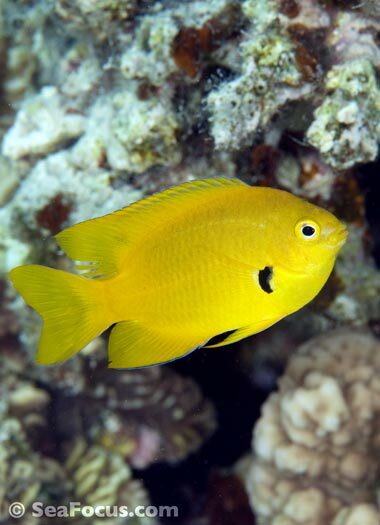 Both parents take an active role with the male fertilising the eggs as the female lays them. The parents then devote a lot of time and effort to looking after their eggs, hoping that the tiddlers get a head start in life. 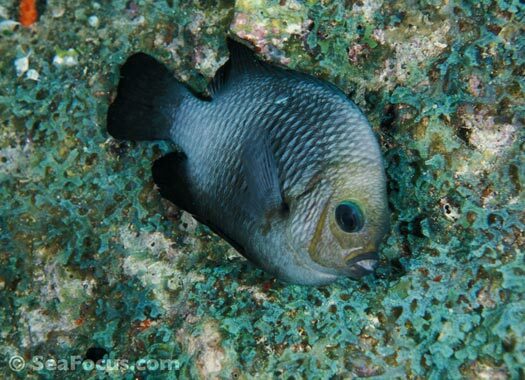 The eggs hatch after four to eight days when both parents dash madly around attempting to protect the brood from marauding rabbitfish and snappers. 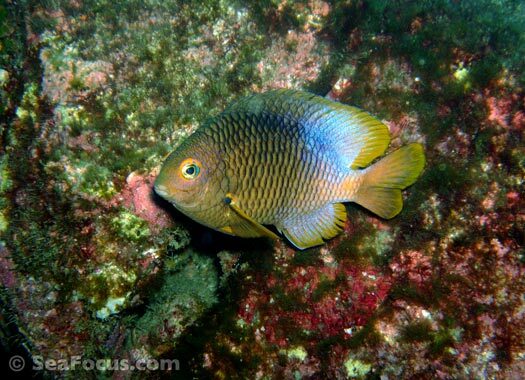 Diving around the Islas Revillagigedo in Mexico revealed several fish species that were new to us – the Clarion damselfish (#2 in the gallery) was one. It's only seen here and in the Galápagos although we never spotted it there. 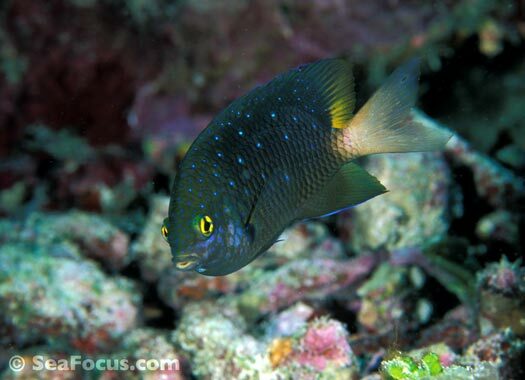 Our next discovery on this dive was the giant damselfish. And giant he really was at around 25cm long. This one was darting around the wall madly and was quite aggressive when approached. We later found out that was becuase he was a breeding male, as shown by the silver-grey head. We could only assume that there was a female or eggs in the vicinity.